Welcome Matthijs “Theo” Lieftink to our new “Pro Player POV” column! Best known for competing alongside Thijs Molendijk on the Netherlands team during the 2017 Hearthstone Global Games, Theo is a constant presence in Europe’s top 100 Legend–ranked players, as well as routinely streaming his gameplay on Twitch. Today, Theo is here to discuss setting out on a competitive Hearthstone career. You’ve watched the biggest tournaments Hearthstone has to offer—now, you want to play in them. There are so many tournaments to participate in that it might be difficult to know where to start and how you can progress. 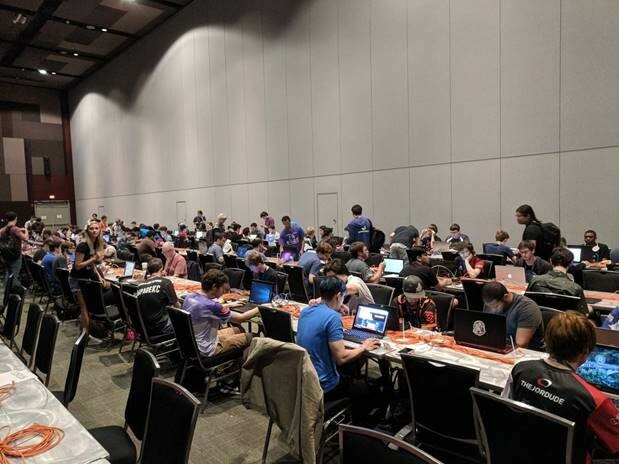 This article will help you get to know what kinds of tournaments there are and how you can become more familiar with tournaments as well as your local competitive scene. The easiest way to begin competing in Hearthstone is one of many online tournaments. Here, you can play on your own schedule and at your own level. You probably want to start with free tournaments, in order to learn how tournaments work and get some experience with them. Good examples of websites that organize free tournaments are ESGA.gg and Battleriff.com. They have multiple tournaments daily aimed at all kinds of players, which allow you to experience different formats and play in a relatively relaxed environment. Some sites also offer buy-in tournaments, starting at just a few cents to enter. The higher the buy-in, the higher the prize—and the stiffer the competition. These tournaments all have different formats and different lengths, so you can pick whichever suits you best. Signing up for online Hearthstone tournaments is quick and easy. Besides these tournaments, you also probably want to look at online tournaments organized by your local Hearthstone community. These tournaments mostly have players from your country and are a good way to get to know your local community. 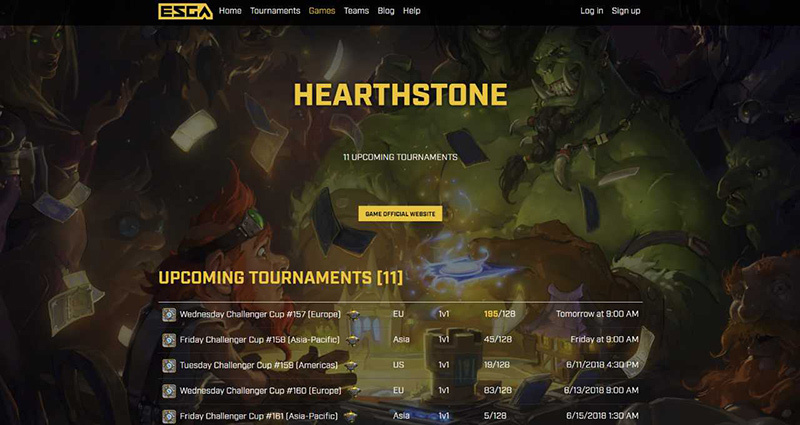 If you want to compete at a higher level, you can play in Challenger Cups, which can be found on the Hearthstone Esports website. Here, you can qualify for the Challenger Finals, which can qualify you for your region’s Hearthstone Championship Tour (HCT) Playoffs! The level of play here is higher than other free tournaments, and you will see everybody try their best to take the top spot and the invitation to the Challenger Finals. These tournaments are a good—and free—way to see how you are doing competitively while even having a chance to eventually make it to the HCT World Championship! Finally, we have the online qualifiers for HCT Tour Stops. It’s usually smart to register for these tournaments as fast as possible, as they fill up quite fast. These are the toughest online tournaments there are—the best players around the world will be competing in them. As such, they are a great way to test your skill and know where you stand. Doing well here can get you noticed, and also will help you get experience with the highest competitive level of play. Just like with online tournaments, there are a number of different offline tournaments you can attend. Most of these you will find locally, which is the easiest way to start playing offline. There are a few different local tournaments you can attend, with a Fireside Gathering near you probably being the best way to get started. These tournaments are very accessible and people of all skill levels will be playing here. They are the best way to get involved in your local community and can be good way to join a local team, who might be scouting for new players at the event. Next up are Tavern Hero Qualifiers, where you can qualify for the Challenger Finals. These are very similar to Fireside Gatherings, but more competitive, as everyone wants that coveted Challenger Finals spot. You’ll see more refined lineups here and you’ll be facing some of the best local players. A full house is the hallmark of any in-person Hearthstone tournament. The last local events you can attend are LAN events. These events probably have the highest level of local competition, and succeeding at one of these will definitely get you noticed. 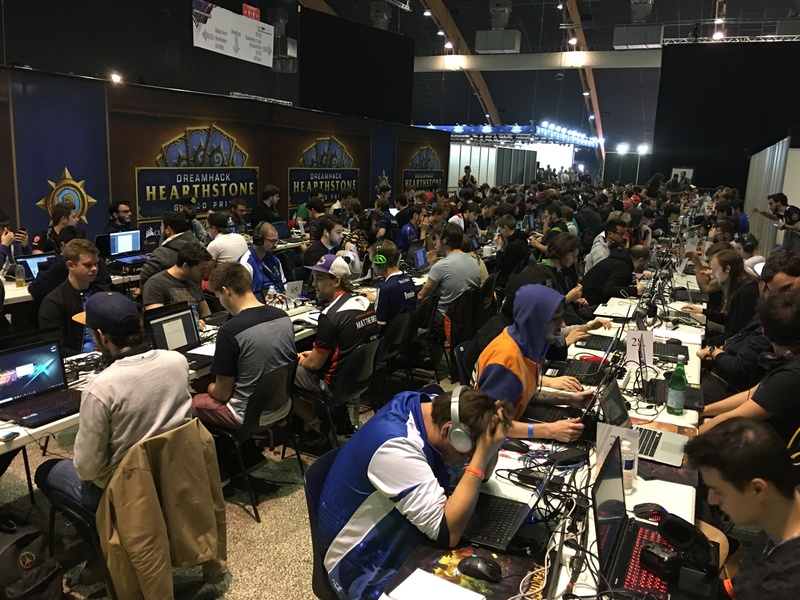 Usually all the big local teams are there—and getting to know some of the best players from your scene at these events will help you get further in your Hearthstone career. The most difficult offline tournaments you can attend are Tour Stops. Just like their online portion, these see the best players from around the world competing for HCT points. You will need to prepare very well for these tournaments, and any mistake can cost you a game. Although these events are very competitive, they are also very fun! Many players are there just for the experience. You can meet some of your favorite players or some of your online friends that you’ve never met before. Now that you know which tournaments you can play in, how do you prepare for them? Here are some tips on how to learn and improve from these tournaments and make the most out of them. When playing in a tournament, you need a lineup, so how do you prepare your lineup and what do you need to keep in mind? First, I would recommend to mostly play decks that you are comfortable with. While other decks may be slightly better, knowing how to play a deck usually helps a lot more. Second of all, you need to take a look at the format. There are a few different formats and they all require a different strategy, so it is very important to make a lineup that fits. Lastly, you want to look at the field you will face and think about what decks and lineups you expect them to bring. When playing in local tournaments you will often see the same players, so this can give you a good indication of what to expect, as most players gravitate towards a certain playstyle. You're up against a wide field, and thousands of hours of practice are in these seats! Another thing you can do is look at recent tournaments and see which decks were played there and did well, as they are a good indicator of what is popular and what the best decks and lineups are. You can use this to your own advantage—but always keep in mind that other people will build their lineups with the same knowledge. With these considerations in mind, you’ll want to choose and tech your decks. You can use stats on websites like HSReplay.net and Vicious Syndicate to make a virtual lineup and quickly see what its strengths and weaknesses are, without needing to know every matchup. After you have played in a tournament, it’s important to look back and learn from what happened. Evaluate how your choices impacted the tournament: Did you face what you expected? Did you find a weakness in your strategy? What was the reason you lost your games? Was it something you could have prevented with better preparation? Did you play the correct tech cards? With future tournaments in mind, think about other decks that you are not as comfortable with—but that might have been optimal—and start practicing those. You won’t be able instantly to know how to build the perfect lineup, so it’s important to keep improving by reflecting back on your experience. Special thanks again to Theo for this awesome guide on how to get started playing Hearthstone more competitively! If you’ve enjoyed Theo’s contribution here, make sure to follow him on Twitter and Twitch. And stay tuned to PlayHearthstone.com for more pro player insights in the weeks to come. Did you find Theo’s guide helpful? Will you be trying to play in a tournament sometime soon? Are there other players you’d like to see stories from in the future? Let us know in the comments!